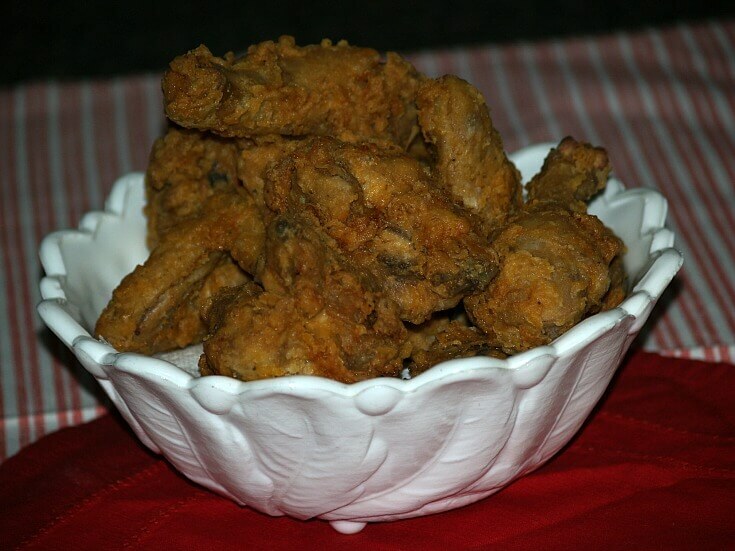 Learning how to make fried chicken that really tasted good was a passion of mine since I was young. young birds, less than nine months old are the best to use in frying. In the grocery these will usually be labeled as fryers. The older birds require a moist heat to cook because they get tougher as they age. Select a chicken for frying that weighs no more than 3 ½ pounds after it has been “dressed out”. This as they are in your grocery store. Almost always young will want the chicken cut into serving pieces to fry. The exception is if you choose to cook a whole one in a large deep fryer like the turkey fryers. The birds weighing less than 2 ½ pounds could be cut into quarters for serving pieces. When you are learning how to make fried chicken, you will prefer to use smaller pieces like I do to make sure they are thoroughly cooked through. Everyone has a different method of breading their bird, especially when first learning how to make fried chicken. The common way is after washing the chicken, pat dry. Add salt and pepper or seasoning in a bag of flour or bread crumbs; put chicken pieces in bag and shake to coat. I prefer to mix an egg or two with buttermilk and dip my chicken pieces in this mixture; then I shake it in flour with my combination of spices. Since I first learned how to make fried chicken I have been working on getting the right combination of spices to cook meats with. I use this blend on everything so it makes a large batch. I love it most when cooking fried chicken. I add 5 tablespoons to every two cups of flour; (this is what it takes to bread 1 chicken.) If you do not like a lot of seasoning only add 4 tablespoons; it needs no additional seasoning. I combine all ingredients in large bowl; use mixer to blend it well. I store on my shelf in clean dry canning jars with lids; makes about 4 quarts. NOTE: I sprinkle on all kinds of meat but it is the BEST FRIED CHICKEN SEASONING. Mix 4 to 5 tablespoons with each 2 cups of flour (I like 5). I dip my chicken in buttermilk egg mixture first; then the seasoned flour. NOTE: As you learn how to make fried chicken, you may like to have your chicken cut the way I do. I prefer small pieces of chicken; I cut the whole breast into half vertically, then in half horizontally making 4 pieces from the breast. Also I slice and “butterfly “ any real thick meaty parts so the flavor gets through better and it cooks more evenly. I do this also with the thigh; cut into the bone and “kind of butterfly” it open. I also make a cut into the leg bone to open it slightly. I do this because I have been served too much chicken which has not been cooked through; this helps. I do this before I begin breading. Cooking fried chicken can be done in several ways. This is one thing that I cannot get away from; chicken deep fried. You do not need a deep fryer; I use a large heavy Dutch oven. I use about 2 inches of oil in the pan. When it gets hot I drop chicken pieces in. Do not crowd the pieces and STAY WITH IT WHEN COOKING. DO NOT LET IT BOIL OVER AND CATCH FIRE. You need a pan big enough that there are several inches above the oil. Fry until golden brown; this makes a crisp crust. 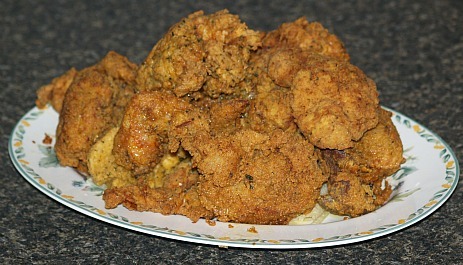 Another way of cooking fried chicken is in the skillet or pan; pan fried chicken. This is the way my mom always cooked fried chicken. Heat a little oil in the skillet and place floured chicken in. Brown both sides of pieces. Cover and cook over a slower heat about 45 minutes until tender. This has a softer crust but very flavorful. Cooking fried chicken can also be done in the oven; oven fried chicken. 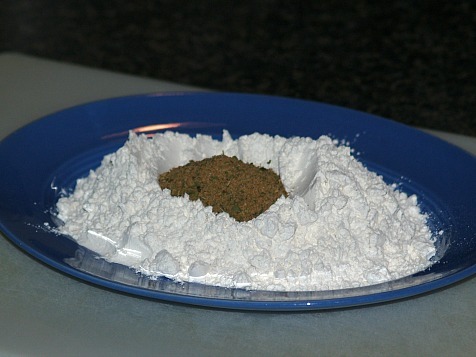 Dip pieces in seasoned flour and place in greased baking pan. Place in preheated oven at 375F degrees about 1 hour or until tender and done; turn chicken over one time during baking. A pressure cooker is another method of cooking fried chicken. Although I never use this, many people do. The chicken cooks very quickly and it is good. The most important thing to tasty fried chicken is in the seasoning which you use. Find one that appeals to you or make up your own with your favorite spices. Learn how to make fried chicken with some “zap”. Delicious! Heat oil to 350F degrees in a large heavy pot about 2 inches deep. NOTE: DO NOT fill more than half full. Beat the eggs in a medium size bowl; beat in the hot sauce and cayenne. Dip chicken pieces in the egg mixture; coat with flour. Place chicken in the hot oil and fry until crisp and brown. NOTE: Dark meat takes longer to cook about 13 to 14 minutes; white meat takes about 8 to 10 minutes. OPTION: It is easy to UNDERCOOK fried chicken if you are not using a temperature controlled fryer. The oil gets too hot, browns the outside leaving the inside raw. I prevent this by precooking before frying. I precook by boiling in water until almost done and then cool. This way I can also use the chicken broth for recipes. Although this recipe for cooking fried chicken is from Kentucky and called Kentucky fried chicken, I think my spice mix above comes closer to the famous KFC than this one does. As you are learning how to make fried chicken you will develop your favorite spice mix to season it with. Season chicken with salt and pepper. Cover with the water and simmer until tender. Drain on paper towels and refrigerate until time to deep fry. Sift flour, baking powder, salt and pepper into a mixing bowl. Add beaten egg and milk all at once.. Mix well. Dip each piece of chicken in batter. Then fry in hot deep oil about 5 minutes until golden brown. Salt and pepper chicken pieces generously. Dip chicken in buttermilk, then flour. Refrigerate floured chicken for at least two hours. Place enough oik in a heavy deep skillet to a depth of 1/2 inch. Heat over moderately high heat. Oil should sizzle when chicken is added. Cook in hot oil until lightly brown on bottom. Turn chicken pieces over and brown on the other side. Chicken takes about 25 minutes to cook. When chicken is done, remove and drain on paper towels. Soak chicken pieces overnight covered with water with 1 teaspoon salt added. Drain pieces. Mix milk and egg together. Sprinkle chicken with salt, pepper and garlic powder. Dip pieces in milk & egg mixture, then dip in flour. Fry in moderately hot hol until brown on bottom. Then turn to other side and brown. When chicken is brown and tender, remove and drain on paper towels.